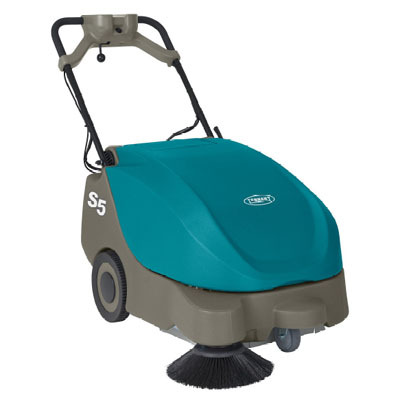 The TENNANT S5 is a battery powered sweeper. The compact unit can safely maneuver down tight spaces such as clothing racks and retail displays. The TENNANT S5 features TwinMax sweeping technology; counter-rotating brushes combine overthrow and direct sweeping principles to capture large and small debris. The handle is adjustable, ergonomically designed to increase operator comfort.